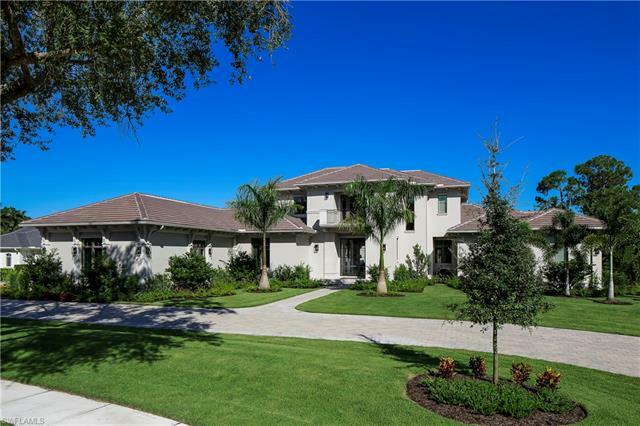 H. 13226 - one of the original, iconic estates at quail west, this magnificent home is stunning in every aspect. A beautiful circular driveway makes way to a private motor court with two separate oversized garages on the side of the home. Located on 1 1/4 acres at the end of a quiet cul de sac creating 400 feet of shoreline, the builder of this luxurious custom model home spared no detail in creating over 9,000 square feet of uncompromising quality. Marble columns, floors and staircases are found throughout. Featuring a truly gourmet kitchen with every desirable high-end appliance, butlers pantry, formal dining room, sunken bar, spectacular home theatre, sound system, elevator and separate guest house with bedroom, living room and kitchenette. Master suite contains separate his & her ensuites, with laundry conveniently located in one of the large walk-in closets. The layout offers a variety of views of the 1,000 square foot award winning pool complete with multiple fountains and spillovers. There is absolutely no finer estate in quail west and this home is being offered far below the cost of the build. Unmatched quality, incredible value and location, location, location! This timeless, elegant and classic one of a kind posh executive style mansion in quail west was designed for comfortable living and lavish entertaining and has architectural details that are beyond extraordinary. Spread over 11,300 square feet of living space on almost 2 acres, there are 6 bedrooms plus a 2 story library, a home theatre, wine room, game room and a bar/lounge, making this a true estate by every definition. Upgrades are extensive to fit the presence of this home, including a gourmet chefs kitchen with custom cabinets and granite counter tops, wood and marble flooring, extensive wood trim and coffered ceilings, a lighting system, surround sound audio system, and a expansive master suite with his/her closets and baths, exercise room with sauna and a separate pool. Additional notables include a private elevator, 5 car garage, custom closets, custom wood beams, copper downspouts and flashing, and more. The exterior features 3 gorgeous pools, a spa with waterfalls, fireplace, and a expansive lanai. The property, itself, features two guest houses, landscape lighting and views from every room and balcony. Award winning builder; providing artistic design, a white glove approach to service, and an unwavering commitment to detail, sets mcgarvey custom homes apart as one of southwest floridas most preferred luxury home builders. Cbs construction, metal framing, anderson wood encased impact glass throughout, hidden rolldown shutters + screens, newerra storefront entry, 4-bedroom suites, pool & powder baths, study, 3. 5-car garage, gourmet island kitchen w/frameless fully overlaid wood cabinetry & soft close hinges, wolfrange gas cooking and subzero panel refrigeration. Master suite has (7 wide) white oak wood plank flooring, sitting room overlooking the golf course/lake view, cozy morning bar, xl custom closets, luxurious master bath. Home automation/security/av package. 3 carrier infinity condensers & dehumidifier. Fi-foil insulation applied on block walls, icynene applied to roof deck for a low humidity environment. Mold-resistant drywall on interior side of concrete masonry walls. Exceptional outdoor living includes outdoor gas kitchen, gas fireplace, salt chlorinated negative edge pool & spa with jandy gas heater, autofill & autolink, led fountain. Expected occupancy 5/2019. With interiors by theory design, the streamsong, built by seagate development group, will feature 5,295 square feet under air and a 1,191 square foot outdoor living area. The exterior of the home will include a covered entry sequence lined by columns and a series of planters. Double doors will open to a foyer and a grand reception room adjacent to the great room. The great room will open to a covered lanai with a fireplace, an island kitchen, and conversation and dining areas. Inside, the great room will anchor a space that will include a dining area and a double-island kitchen. A hallway overlooking a garden courtyard will lead from the living area to a club room and three guest suites, each of which will have a full bath and one of which will open to the outdoor living area. A study/office is located at the opposite end of the hallway, just outside an owners suite that will include a vestibule, a bedroom that will open to the outdoors, two walk-in closets, and a bath with his and her water closets, his and her vanities, a free-standing tub, and a walk-in shower. To be completed spring 2020. This magnificent one of a kind estate in quail west was designed for comfortable living and lavish entertaining and has architectural details that are beyond extraordinary. Spread over 9,495 square feet of living space on almost 1. 5 acres, there are 6 bedrooms plus a office, 7 full baths, 2 half baths, and a bar/lounge room making this a true estate by every definition. Upgrades are extensive in this home, including a newly remodeled gourmet chefs kitchen with custom cabinets and quartz counter tops, wood and marble flooring, extensive wood trim and coffered ceilings, a smart home lighting/sound system, plantation shutters, surround sound audio system, and a expansive master suite with his/her closets and baths. Additional notables include a elevator, 6 car garage with room for lifts with a 2nd story 36'x30' bonus room above it, custom closets, custom glass blown blue chandelier, and more. The exterior features an expansive 7,000 square foot lanai with a gorgeous pool surrounded by orchids, a spa with waterfalls, a outdoor kitchen, fire pit and gas lamps, lush landscaping, and a 1 bed/1 bath guest house. The property offers peaceful western sunset views from every room! H. 14394 -situated on one of the most exquisite sites in all of quail west, this stunning home sits on over one acre and offers long water and golf course views from every breathtaking angle. With over 7500 square feet, this 2-story 5 bedroom, 5 full and 3 half bath spacious estate with private elevator offers custom rooms to fit your every need. A state-of-the-art media room with starlit ceiling, huge fitness studio, wine room, gourmet kitchen and guest room with fireplace is complemented by a a second floor loft family room, access to 2 guest suites one with a private balcony and gorgeous sunset views. The expansive and inviting lanai with a number of covered lounge areas offers a full kitchen, fireplace and inviting pool and spa with water features and fire bowls. A grand entrance with circular drive and porte-cochre gives way to a 4. 5 car garage and flowing pathways. Enjoy a grand lifestyle in the friendly and welcoming community of quail west.